As of this spring, you can buy fair trade melons in the U.S. Good news? Unfortunately, no. Those melons come from multinational Fyffes’ Suragroh plantation in Honduras, the site of ongoing, unresolved labor disputes for more than a decade. 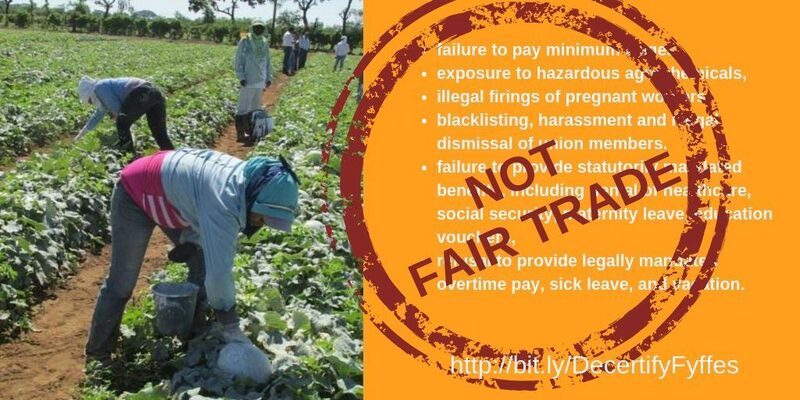 Despite this ongoing, internationally reported situation, Fair Trade USA (FTUSA) went ahead and applied their label—and considerable marketing clout—to melons grown by workers suffering systematic human and labor rights abuses. That’s exactly what you choose fair trade certified products to avoid. When labor rights groups brought the situation to their attention, Fair Trade USA didn’t admit to an error or take action to protect workers. And unfortunately, for those of us who have been in the fair trade movement for a while, that wasn’t a surprise. Instead, it’s consistent with a long-held pattern of putting market growth and corporate partnerships ahead of farmers and workers, the very people fair trade is supposed to benefit. Since 2000, the fair trade marketplace has exploded with growth, with the emergence of many fair trade standards and certifiers, to say nothing of the multitude of phony claims in the marketplace. The organic certified market has thrived, in part, due to a vibrant community of farmers, consumers, researchers, and watchdogs that fight for the integrity of organic standards and products. Though imperfect, organic standards and process incorporate public commentary and transparent process. As the fair trade market is private and unregulated, anyone can make any claim they like, and terms like “fair trade,” “direct trade,” “fairly traded,” etc., have proliferated. As a result, the fair trade market has become increasingly fractured, diluting the positive impact for producer groups. Fair Trade USA, the largest fair trade standard in the United States, has been largely responsible for this trend. 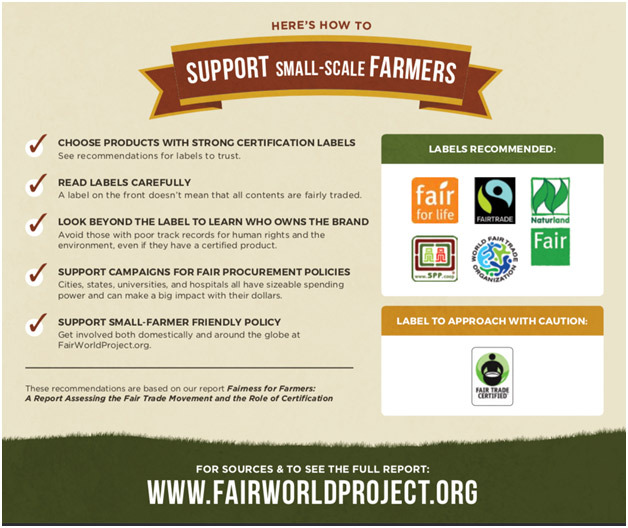 Fair World Project(FWP), in collaboration with other fair trade movement organizations, has attempted to hold FTUSA and other fair trade standard holders accountable. FWP grew from a demand by civil society to ensure the integrity in the fair trade market place, resist “fair washing” and ensure that the United States remained an open marketplace for small-scale producers in the Global South. Since 2010, Fair Trade USA has attempted to water down fair trade standards and monopolize the movement. In a controversial move, Fair Trade USA broke away from the international system in 2011. FWP opposed Fair Trade USA’s unilateral moves, including plans to certify large-scale plantations, while small-scale family farmers continue to remain without a fair marketplace. Since 2012, Fair Trade USA has successfully eroded fair trade principles and practices with weak standards, a complete lack of transparency and zero accountability to producer organizations and networks. Though the fair trade movement originally grew to support small-scale producer organizations, fair trade standards have evolved to include “hired labor” operations, such as the fair trade melon plantation at the heart of the current dispute. FWP’s report, “Justice in the Fields” examined the social and fair trade standards for farmworkers in the U.S. and globally. Fair Trade USA’s standards scored poorly in FWP’s analysis. Specifically, Fair Trade USA’s process and standard, “does not significantly involve workers in monitoring or enforcement or require higher than minimum or average wages.” Nonetheless, Fair Trade USA certified produce from plantations is entering the marketplace at an increasingly fast rate. Both reports underscore both the limitations to Fair Trade USA’s standards, and the lack of accountability to stakeholders and the fair trade movement at large. Now, Fair Trade USA is complicit in certifying human rights abuses and labor violations in Honduras. Fair Trade USA certified Fyffes’ Honduran melon subsidiary (Suragroh) in April 2018, despite a long list of serious human and labor rights violations. Those include failure to pay minimum wages, exposure of workers to hazardous agrochemicals, illegal firings of pregnant workers, blacklisting, harassment and illegal dismissal of union members. Workers report the company fails to provide them with statutorily mandated benefits, including denial of healthcare, social security, maternity leave, education vouchers, overtime pay, sick leave, and vacation. These violations have been documented in international press coverage and represent a labor dispute between the company and its workers that go back over a decade. FWP and others in the fair trade movement have long argued that plantations have no place in the fair trade model. And labor rights organizations agree that the best way to protect workers’ rights is by organizing—the very sort of union campaigns that are currently being undermined at the Suragroh plantation. FWP’s open letter to Fair Trade USA highlights the standard’s shortcoming and the organization’s lack of commitment to farmworkers. Consumer demand for ethical products is growing. But slapping a Fair Trade Certified label on human rights abuses is not the way to meet that growth. Indeed, as global inequality grows and climate change renders our food system evermore precarious, it’s clear that real change is needed. Millions of small-scale farmers around the globe are building strong, resilient organizations to tackle poverty and climate resilience in their communities. And committed fair trade companies are collaborating with them to build supply chains based on transparency, fair prices, human rights, and empowerment. Buyers should be able to trust that these basic values are what stands behind a fair trade label. Instead, Fair Trade USA has prioritized market share and public relations over substance and accountability. While there may be a short-term feel-good moment in picking up a fair trade certified melon, it won’t last. By certifying these human rights abuses, Fair Trade USA is ignoring the very people whose livelihoods it claims to benefit. They are also risking the integrity of the word “fair trade,” rendering it meaningless and undermining the decades invested by small-scale farmers and their allies in building a movement. Transparency and integrity are important, especially in a world dominated by the words “fake news.” That’s why we’re asking you to sign onto our letter to Fair Trade USA asking them to drop their Fair Trade Certified label from Fyffes’ melons immediately. Your favorite grocery store probably also has a way to leave comment cards. That’s why we’re also asking you to share this message with them. Let them know that you’re concerned about fair trade melons, and that you are concerned about the use of the Fair Trade Certified label on produce from plantations in general. Concerned organizations can sign onto our open letter.